The Government and Geographic Information collection is located in room B190. Not all materials are catalogued in NUsearch. For more about this collection, visit the Government and Geographic Information collection. Northwestern faculty, students, and staff with specific data needs should consult Social Science Data Services. Social Science Data Resources, Federal Depository. 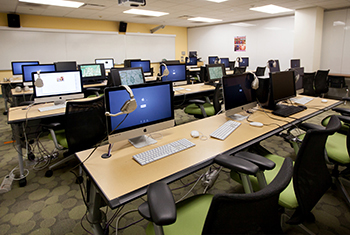 Innovation Lab - Active Learning Classroom. Seats 24. The space is equipped with Solstice and Cisco Spark board for wireless content sharing and whiteboards and sketch tables for more analog work. Faculty and graduate students can reserve the room via Outlook. Equipped with iMacs and PCs. Teacher Station includes: Projection, iMac (Mac OS), Document Camera, Region Free DVD Player, VCR. The capacity is 20 people. 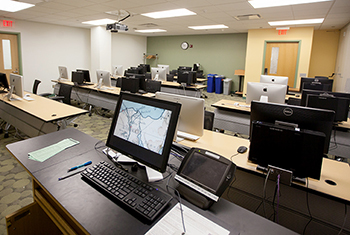 This lab is available for general student use evenings and weekends.